I tell my kids that things in life usually don’t turn out like you thought they would. You need to be flexible. Have a Plan B, and C, and maybe D. Just because you cannot or did not do what you planned doesn’t have to mean that it was a bad trip, or that you failed. You just didn’t do what you expected. Our plan to ride the North loop of the Idaho Hot Springs Mountain Bike Route last summer did not turn out like we thought it would. Logistics and mechanicals pushed us into an alternate plan. Originally we had several people going and planned to drive two cars, parking one at the end in the town of Crouch, and the other at the trailhead near Banner Summit. In the end, it was just my brother Jason and I, so it made sense to only drive one car. We figured we could maybe hitchhike from Crouch to the trailhead (about 60 miles). On a Sunday afternoon we drove to Boise and stayed at my good friends’ house, Mike and Kristiana. We enjoyed an evening hanging out with them, and a spectacular breakfast Monday morning before heading out. We arrived in Crouch fairly early, about 8:30 am. Mistake number one, was that it was July 4th week and the whole town was gearing up for their celebrations. As such, any possible parking was blocked off. We checked a dozen places and no one would allow us to park our car for a few days. In fact, most people were curt, even rude with us for even asking. We drove up and down the highway looking for possible places, to no avail. We finally convinced a nice guy who owned an auto repair place to allow us to park our car there. We were really grateful for his kindness. After the cold reception from the vast majority of the locals, we were not too positive we’d be able to get a ride. In fact, no more than a couple miles out of town, we had already been buzzed by several huge pick-ups with U.S. flags waving from them. Needless to say, we got a late start, setting out from Crouch at around 10:30 am. We rode Highway 17, or the Banks Lowman Rd. with vague notions of maybe getting a ride in the back of a truck. I had ridden this road a few years earlier on a bike tour and it is beautiful. The road rolls up and down along the Payette River. We rolled into the tiny “town” of Lowman and took a break at the small grocery store there chatting with the owner. Riding pavement on a fully loaded fatbike was not the most enjoyable riding, but it wasn’t as bad as I thought it would be. 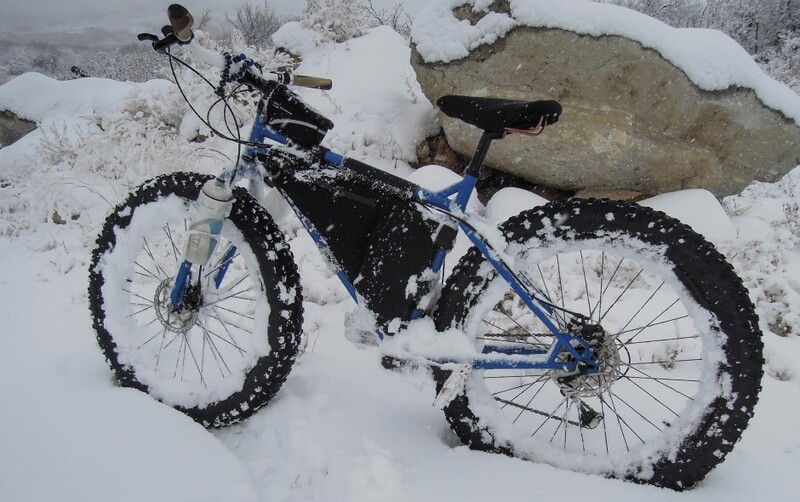 Jason was on his Salsa Timberjack with plus tires (3″). It was 28 miles to Lowman with 2100′ of elevation gain. That was about when I noticed some noises coming from my bottom bracket. Sounded kind of like a pinball machine, pinging and popping. Jason wasn’t too thrilled when I told him. “How long has it been since you serviced your bottom bracket?” Me, sheepishly, looking at the ground, “I dunno.” He rolls his eyes. We weren’t too anxious to ask for a ride so we kept riding. How bad could it be? We were feeling pretty good and were making decent time. After Lowman, the climbing was steady but not steep. But the closer we got to the summit the steeper it got and we were tired from riding all day. Another 4000′ of climbing and 30+ miles, we finally topped out, and my bottom bracket was not in good shape. It was still pedaling okay, just lots of noise and feeling all loose and unstable. We dropped off the summit and rode about a mile to Bench Creek Campground. We were really tired, my bottom bracket was messed up, and we hadn’t even started the Hot Springs Route yet. It was a nice campground, and we were happy to sit down and relax. In a situation like this, no one wants to be the first to bring up the obvious. No one wants to look like the weak one, the wimp, bailing on the original plan. But he’s my brother, we know each other well, and have ridden many miles together, shared many nights together in tents. We both agreed it was not a wise thing to head out into the backcountry with a wonky bottom bracket, that could fail at any time, leaving us stranded. It was more than 100 miles of dirt riding before the town of McCall, where there might be a replacement bottom bracket. We both also admitted that a 62 mile ride on the highway with 6000′ of climbing had taken its toll on us as well. Options? Not many. So plan B. How could we make the best of this. Hot Springs was the answer. On the ride up Highway 17, then 21, (the Ponderosa Pine Scenic Route) we had passed several hot springs. What if we just focussed less on riding and more on soaking in hot springs. We had a plan, and though quite disappointed we wouldn’t even make it to our planned route (which was actually only a couple miles away), we felt okay with our change of plans. We had a nice relaxing evening in a beautiful camp along a creek in the woods. You can’t ask for much more than that. We bathed in the icy Bench Creek, set up camp, cooked and ate, went for walk, and just enjoyed being outside in a beautiful, wild place. We were grateful for opportunities to get out and do things like this. I was wishing I had my tenkara fly rod. The next morning we packed up and bombed the highway back the way we had come. It was pretty thrilling hitting near 40 mph with fat 4″ tires. After about 12 miles we turned off for Bonneville Hot Springs. We rode about a mile to the campground on a dirt road, then continued on singletrack out to the hot springs. There’s nothing quite like soaking in hot water in the mountains. It almost feels like cheating. We soaked in various pools of varying heat for a couple hours. It was pretty great. After thoroughly enjoying the soak, we reluctantly loaded up and headed out. A few miles down the road we stopped at Kirkham Hot Springs. Most of the hot springs along this highway also have campgrounds near them. Kirkham was fairly crowded and it was midday, rather hot, so after a snack break, we continued on. Our destination for the night was Pine Flat Campground and Hot Springs. I had camped there before on a previous bike tour (road), and had also stopped at the hot springs after a backpacking trip in the Sawtooths. These are truly epic hot springs. They are only about 3/4 of mile from the campground and require a short wade in the cold Payette River to get there. But what you get is a literal waterfall of hot water. Think outdoor shower. Really amazing. After setting up camp, we headed down to the springs. We alternated soaking, then dunking in the cold river. It was really refreshing. Once again it was a really nice relaxing, eating dinner, and chatting and soaking in the hot springs. Jason forgot his spoon or lost it along the way. He looks over at me with sad eyes, looking at my spoon. My response? “You have a knife.” So he improvised. We slept in, we lingered, we reluctantly packed up our bikes. The ride back to Crouch was smooth and easy, mostly downhill. In Crouch we went to the grocery store deli and had sandwiches. Delicious. We don’t want to go home just yet, and it’s quite hot. So we drive up Middlefork Road, the road the goes along the Middle Fork of the Payette River, the very road we would have been coming down at the end of the Hot Springs Route. We find a nice stretch of the river, change into swim trunks and go for a nice swim in the cool water. We wade out to a nice big boulder in the middle of the river and just sit and talk, for a long time. When we got hot, we’d slide off the rock and dunk ourselves in the cool water. It was so nice just to sit with the sounds of the river and the tall trees all around. After a couple hours, we dried off, and drove the 5+ hours home. Was our trip a failure? We certainly didn’t accomplish what we set out to do, but we improvised, salvaged the trip, and still had a nice time. For us, it’s all about being outside and enjoying earth’s natural beauty away from “civilization” and the noise and chaos of the city. In that sense, it was a great trip. But we still want to go back and ride that North Loop. Maybe this summer.